adidas TERREX is the athletic brand in the outdoors. It’s the brand for those who follow their insatiable passions, live without limits and conquer new territories, no matter what they do - be it climbing, trail running, mountain biking, ski mountaineering, kayaking or combining several activities. 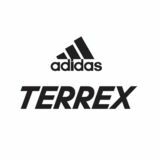 adidas TERREX is proud to count athletes such as Kevin Jorgeson, Sasha DiGiulian, Sam Sutton, Pete Henke, Sachi Amma and the Huber brothers in its family. Every year, the brand sponsors adidas ROCKSTARS, the contest for the international climbing elite, as well as the adidas Sickline Extreme Kayak World Championship. The TERREX range is made of versatile and lightweight products that enable outdoor athletes to achieve their personal best by using the best technologies and finest materials.